| > ToSeeTheGlory > What is Normal? It is funny how we can grow up in a culture and not realize that there are other ways of doing things. We don’t think twice when we get in a car and only get in if there are enough seats to sit in. We expect and even demand personal space especially when traveling. We do things the way we were taught by our parents or schools. Sometimes we don’t even know why we do things the way we do. 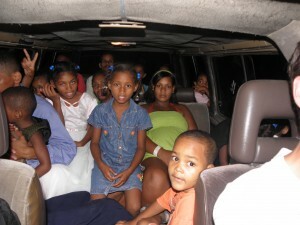 For an example, here in the Dominican Republic there seems to always be room for one more. We have been transporting a family and some of their neighbors from another village to our church in Villa Paraiso. They will pile in and if I think I am picking up a family of 5 I always end up with a full load. In the picture above you can’t even see the 2 kids behind the back seat or one (or 2) hiding behind me and the 2 in the front passenger seat. All this to say – Why are we doing what we do in our Spiritual walk? I have found myself over the last few years questioning everything we do. Why do you pray with your eyes closed? Why do we go to church? Why do we say what we say (as in our christian vocabulary)? AND Does it really say that in the Bible? I believe we should question. Not question God, but question our beliefs. Question what man has taught you! Why do we do what we do? Is it because of tradition? And if so, is that tradition harmful to your walk? Does your beliefs keep you from fully trusting God? So driving in the USA and having laws saying to have a seat belt on every person is not bad, it does not bring harm, in fact it may save your life. But believing God is always waiting for you to fail and thus you cannot enter heaven, like many of the religions seem to teach in between the lines, that can keep you from really trusting Him. God, our loving father who sent His own son Jesus to die on the cross for your sins, and that was while you were still a sinner deserving death, is not waiting for you to fail, but is waiting for YOU to come to Him. So next time you see something done differently and are thinking it is wrong, try questioning why you do it the way you do. This entry was posted in Bible study and tagged in God's love, God's way, man's way, questioning, traditions.